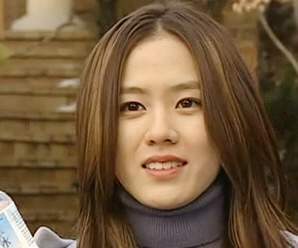 I watched Delicious Proposal (MBC, 2001) a long time ago, back in the age of the dodos when I didn’t know how to do screencaps (or was too lazy to?). Thus, excuse the lack of scene-corresponding pics! This drama caught my attention for two reasons. 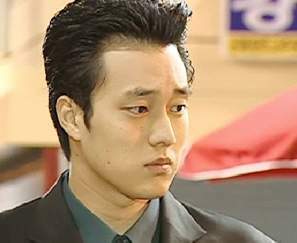 First, So Ji-sub! (In a supporting role, alas.) Second, its director was none other than Park Sung Soo, PD of Ruler of Your Own World. Showcasing wok wizardry and rivalry, the first two episodes set the stage for this 16-episode drama. 1) A small Chinese noodle/dumpling eatery owned by Kim Kap-su (played by the fantastic Park Geun-hyeong). 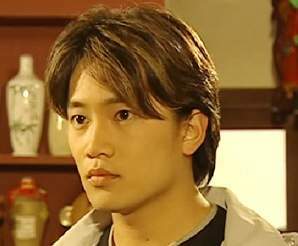 He has a son, Hyo-dong (Jeong-joon). His wife left him abruptly one day when Hyo-dong was still a child. Father and son live in a house next to their restaurant. They share the house with Kim’s sister, her husband Yun, and their daughter Mimi. Yun’s dream is to own a hair salon. In the meantime, he offers hairstyling services to ajummas in the house and this drives his wife crazy because of the smell of the perm chemicals. 2) Golden Dragon Restaurant owned by Jang Tae-kwang (Kim Yong-geon, who, by the way, is Ha Jung-woo’s dad, ha!). The restaurant is supposedly the best in Korea and has several branches. Jang and his wife are very wealthy and they live in a villa in posh Kangnam district. They have two children, Hee-moon (So Ji-sub) and Hee-ae (Son Ye-jin). Hee-moon has just returned with an MBA from the States while Hee-ae is graduating from university. Jang has a secret ambition: to take over (or in his own words, to “trample on”) Kim’s humble noodle eatery. Jang and Kim came from the same orphanage and when they were teenagers, they trained under the same master chef. Apparently the chef favored Kim and bribed the judges of a cooking competition so that Kim would win. Jang has bore a grudge against Kim all these years because of that incident. 3) Hong Kong Restaurant. The head chef is Cho Pang-dal who used to work for Kim. Hyo-dong (Kim’s son) is furious with Cho for “jumping ship” and goes to the restaurant to beat him up. Cho’s men then retaliate by trying to beat Hyo-dong. While running away from them, Hyo-dong chances upon the open trunk of Hee-ae’s car and hides inside. He falls in love with Hee-ae at first sight when she finally opens the trunk after he has almost suffocated inside. 1) Kim Hyo-dong works part-time in a convenience store. He interviews for a job as a bodyguard but arrives late because of the incident mentioned in the paragraph above. During the interview, his father (the noodle eatery owner) calls him a couple of times to remind him to have his breakfast. As a result of those interruptions, Hyo-dong does not get the job. He is furious with his father but does not stay angry for long. A few days before the interview, Hyo-dong goes with his buddy Jun-su (none other than Ji-sung!) to buy a suit. Stripped down to his underwear in the fitting-room cubicle, a girl suddenly pulls aside the curtain. Instead of apologizing, she stares curiously at him and then runs off. Hyo-dong tries to chase her but loses her. He is furious because only his beloved should see him in such an undressed state, he says. Later, while returning with Jun-su in the latter’s car, they spy the same girl squatting in an alley relieving herself. The girl is embarrassed when she realizes it is Hyo-dong who has seen her. So now the two of them are even! 2) Ma Shin-ae (Soh Yu-jin) is the girl who sees Hyo-dong in his undressed state. Shin-ae’s dream is to own the best restaurant in Seoul, but she has no money. So she does what she can to make ends meet, selling all sorts of wares in the marketplace even as she dodges her creditors. With a little money saved, she arrives in Seoul and enrols in a cooking school. To her horror, Hyo-dong is in the same class. 3) Jang Hee-ae is the daughter of the rich restaurant owner, Jang. She loves to cook but has to learn the skills secretly because of her father’s disapproval. Her mother keeps arranging blind dates for her, but she cleverly avoids getting herself matchmade. One day, she finds a stranger in the trunk of her car and she sprays him with pepper spray. After the stranger professes his innocence vehemently, she lets him go but gives him her water bottle since he looks like he is dying. Unknown to her, the stranger has fallen in love with her at first sight. He guards the plastic bottle as if it’s some priceless treasure. When his father throws the bottle away with the trash, he chases after the garbage truck but to no avail. Fortunately for him, he manages to find out that this beautiful girl is enrolled in a cooking school so he signs up too. But to his horror, on the first day of class, who should he see but that girl who saw him in his briefs! 4) Jang Hee-moon is the older son of Jang, the rich restaurant owner, and he adores his sister and only sibling, Hee-ae. His father tells him his secret ambition of taking over Kim’s noodle eatery because of an old grudge. Confident, arrogant even, Hee-moon decides to check out the eatery with his sister. While they are slurping up the noodles at the eatery, a young man walks in. The man does a double take when he sees Hee-ae and the biggest smile spreads across his face, as if he has seen the girl of his dreams. The man dashes out to tell his friend. The friend comes back to the eatery to check Hee-ae out and manages to find out that she is enrolled in a cooking school. He goes back to tell that lovestruck young man. No, Kwon Sang-woo does not appear in the first two episodes, but I thought I shouldn’t keep everyone in suspense. I’m not a fan, but he is funny and wonderful in Delicious Proposal as delivery man for our humble noodle eatery. No self-consciousness (that which has plagued many stars, making them too aware of their superstardom when they are supposed to be acting and not posing in front of the camera) here at all. Just a young man honing his craft. If you love Jisub and Kwon Sang-woo, you must watch We’re Dating Now. Both of them have a lot more scenes there than in Delicious Proposal. Haha this drama is why seeing KSW as the male lead is awkward for me because I always get reminded of his role as a “chul-ga-bang” in this one. I felt sorry for SJS when I was watching this because his role was so small and his character was badly underdeveloped. I did like Jeong Joon as the male lead though and I like Park Seong-soo for casting less handsome and less famous actors as the main lead in his dramas. Too bad he’s not making dramas anymore! Oops, I do not know the OST for the drama. Have you checked Soompi? I hope you’ll be able to find it soon. It’s been 1.5 months since we last “talked” and you’ve already watched it. How cool! I’m glad you enjoyed the drama.